Wasn't she already awake? She invariably asked this as well, and the response was always a smile, an entirely too patronizing smile, and "You have much more to know, and that knowledge will be your awakening." Finally, it came to her one day when she realized what being a ghola truly meant. A clone, but not just a "normal" clone that had the same genes and physical makeup as a predecessor, but a clone that possessed memories of its former life as well. So that's what the education was all about, she thought to herself. It was teaching her about the life she had led before the God Emperor ascended to His throne. Before then, she knew him as Donald Trump, a real-estate billionaire turned TV star. He was human once! A human being! With arms and legs and head and skin and everything! But even after she had deduced this, she still felt that she hadn't achieved the goal that had been set for her. She didn't feel any more awake than any other time after she had emerged from the strange laboratory on the day of her birth. Every day, the same routine. A small group of female soldiers came to her private quarters. The leader motioned to her in an almost ritualistic fashion. "Arise, young Hillary. It is time for your awakening. You will be a member of the God Emperor's court until He deems your memories fully restored, at which you may come and go at your will as a Freewoman." Excitement overcame her. She followed the squad to an incredibly enormous room, adorned in exquisite fabrics and - GOLD! Gold on the walls and supporting pillars and arches, all around. A long table with the most elaborate silver settings she had ever seen was at the center of the room. One tall upholstered chair sat at one end of the table; the other end had a place-setting but no chair. She heard a grinding, powered noise. Into the room rolled a giant tracked vehicle - a cart, all golden, with a huge throne on its flat bed. 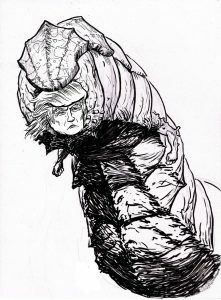 There He was on His cart, in all His wormy glory: The God Emperor Trump. The cart rolled up to a fair distance from the end of the table, then the worm slithered toward the front end where little stumpy arms could reach the place-setting. "Hillary! How are you sweetheart? Sit down, let's have a little talk, okay?" Apprehensively, she approached the chair and sat. Next article:Latest Book in Seducing the Guardian Series is OUT!